Within the industry they service, accuracy and precision are important factors. There are several seemingly trivial, but very significant quality assurance criteria that their plastic products need to fulfill. For the most part, their review process is very manual and therefore time-consuming. The QA operators have to inspect products based on a variety of criteria including appearance, color, damage, etc. In some cases, there are acceptable levels of deviations, but even then the allowances are relatively precise. If there is an issue with the product, the operator has to flag it immediately because they don't want to waste materials and overhead to produce an unusable product. Depending on the severity of the issue, the entire production process may be shut down until the issue is resolved. Of course, this impacts production schedules, costs and revenues. SSI was using FileMaker Pro 6 to help document and track their quality control processes. Essentially, each operator had to complete a questionnaire covering various product attributes. Their single questionnaire was comprehensive and included quality attributes for all their different plastic parts and products. For each inspection, the operator had to respond to each question, whether it applied to the product that they were testing or not. In addition to a long questionnaire, once a test was started the operator could not go back to make changes or stop the test. They had to cycle through the entire process in order to start a new test. This made the testing process tedious and inefficient. And so over time, the application became unreliable and unattractive to users. SSI's commitment to quality assurance led them to The Support Group. They knew that if they could catch problems early in the production process they could cut down on compounding issues and waste. They not only wanted to streamline the testing process but also to create a useful tool for the operators. We are very satisfied with The Support Group. They designed and built us a new Quality Assurance database that runs our entire manufacturing system. I really liked how even when we “changed” our expectations of how we wanted the system to work they did not give up; they continued offering solutions and accepting our requests. They provided really good balance on the compromises needed to get to the project completed – that is good collaboration. The Support Group created a new FileMaker solution using FileMaker Pro 15, the latest version of FileMaker Pro available at the time. During the discovery and design phase, the parts and products that needed to be tracked along with their respective quality attributes were identified. And helpful product information and instruction were incorporated directly within the interface in order to enhance data integrity as well as serve as a resource for the operators. 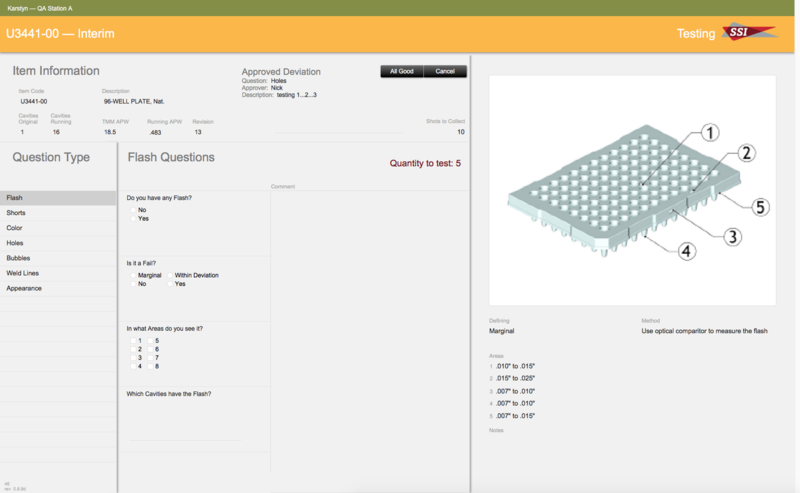 The new custom application provides diagrams so that operators can be sure that they are inspecting the correct product and understand what to look for on each part. There are also references and notes within the interface to guide the user through the testing process. For example, the interface will display the required test quantity and acceptable levels of deviation for different tests. The Support Group's team of FileMaker certified developers built logic into the questionnaire so that the operator only has to respond to the quality attributes based on the part/product that they are testing. And questions progress based on previous responses so the operator really only responds to exceptions. The new system also integrates with SSI's MRP backend database in order to provide real-time data checks. For example, their application accesses a scale file, which provides data for certain quality thresholds. This integration reduces manual data entry and automatically ensures that parts meet minimum levels of deviation. And a simple, but powerful dashboard was created to display the status of all of their active tests. This allows managers to quickly review the tests that are being performed and respond promptly if there are any significant problems. Because the business application was designed specifically with end users in mind, it is very intuitive and user-friendly. Training is streamlined due to the inherent instruction within the system. Since the data entry portion of testing has been simplified, SSI is now able to focus on producing high-quality parts. Upon deploying the new system, SSI noticed an improvement in their data integrity. The new application reduced the manual entry of part numbers and products. The datasets were converted to lists for the operator to select so there are minimal free-form fields. And typos and errors are reduced due to data validation rules. Please feel free to contact us to learn more about our services and schedule a free initial consultation.